Salt is the prime ingredient in shaping lives. Without salt there is no flavour. This book holds a great story. A story of love, family, tradition, expectations, innovation and breaking free of the cultural ties that bind. It also hides a secret, one that should not have been hidden from us for so long and is a relief to finally have out in the open. What is the secret? It is that Indian food can be diverse well beyond the standard curries that Indian cuisine is best known for...not always in a good way. The truth is I like the concept of Indian food, the combination of exotic spices should be right up my alley, at times I cook it myself and more often from a pre- made spice mix or a jar. Sacrilege I know. But I often avoid it particularly in restaurants where the stodgy curries, dry over-cooked meat and soggy breads are the mainstay. The forward of this book by food critic Les Luxford confirmed my beliefs of Indian cuisine in Australia. We were way behind the benchmark that restaurants like The Bombay Brasserie were setting in London and Australia was lacking high quality Indian food. That is until Les discovered Abhi's, an Indian restaurant in Sydney and touted it "A true revelation" the review bought the masses flocking and a legend was born. Abhi's is owned and run by husband and wife team Kumar and Suba Mahadevan and now many years and a second restaurant opening down the track they bring us their secrets in the form of "From India, Food, Family & Tradition". This book is so much more than a cook book. It tells Kumar's life story from his vegetarian Brahmin upbringing in Tamil Nadu absorbing traditional cooking techniques from his grandmother through to rebelling against his caste to drop out of an economics degree to pursue a career in the kitchen. With a career that took him from the 5 star kitchens of the Taj Mahal Palace Hotel in then Bombay to a war zone at the Sheraton Iraq and onto London and eventually Sydney Kumar has shown that hard work, 96 hour weeks and persistence pays off and that even a life long vegetarian can embrace meat despite it being the core of his religious upbringing. India for me has always been shrouded in a mystical quality which is as fascinating as it is intimidating. Whilst the book brings Indian cooking into your kitchen it's tales really highlight the vast cultural divides between the reality we are use to here in Australia to that in India. Kumar's arranged marriage to Suba led by the advice of the family astrologer and enacted without barely meeting prior is so far removed from what I can relate to it is hard to comprehend but that really is what makes the world we live in so great and why I have dedicated my life to travel and discovery. 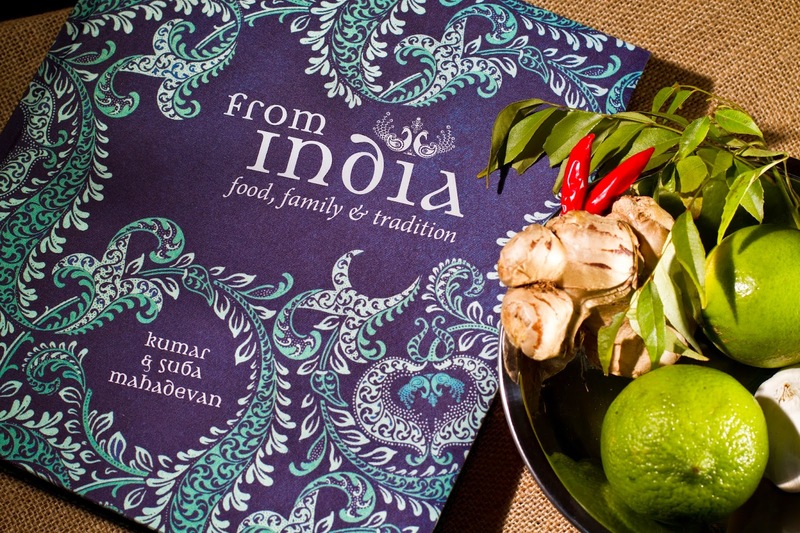 The food Kumar brings us in this book is like a bridge between those differing cultures and that is what I love most about cooking and eating world food but what makes this book great is the diversity of Indian cuisine it presents. Whilst of course you will find curries as what is India without the curry you will also experience a vast variety for your taste buds. Stuffed Squid, pudding, dumplings, quail, semolina crusted salmon, spice crusted whole fish, crispy pork, pistachio ice cream it goes on. The techniques presented are not intimidating, the ingredients relatively easy to obtain and the final result simply delicious. If you are looking for a journey in your kitchen, one that will take you to exotic places and exotic tastes I recommend you get your mitts on this book, dive into your spice cabinet and get cooking. It is really true that India is the taste of tradition, I came to know this, when I have visited India last year with my family. First we hired Indian travel agent from Delhi airport and then we reached the royal land of Rajasthan. We travelled many places in Rajasthan and eat different verities of food. It was really a great experience for me.